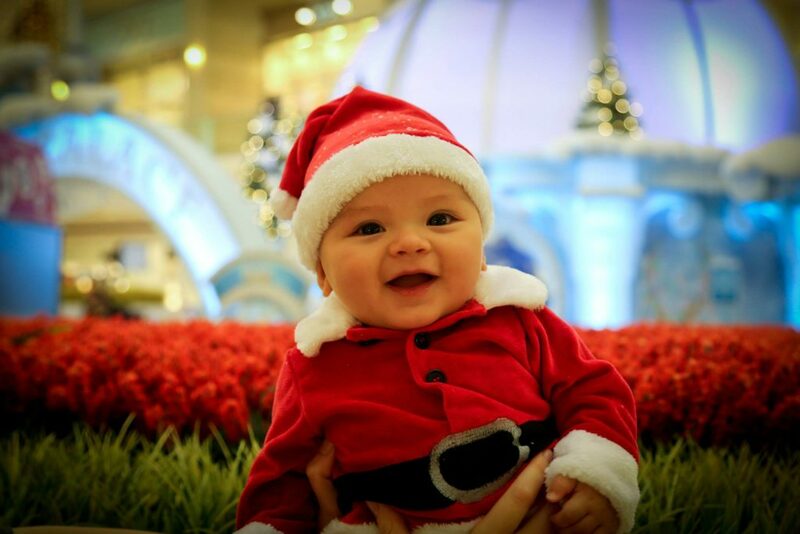 Your baby’s first Christmas is a perfect time to start new family traditions and include baby in old ones! 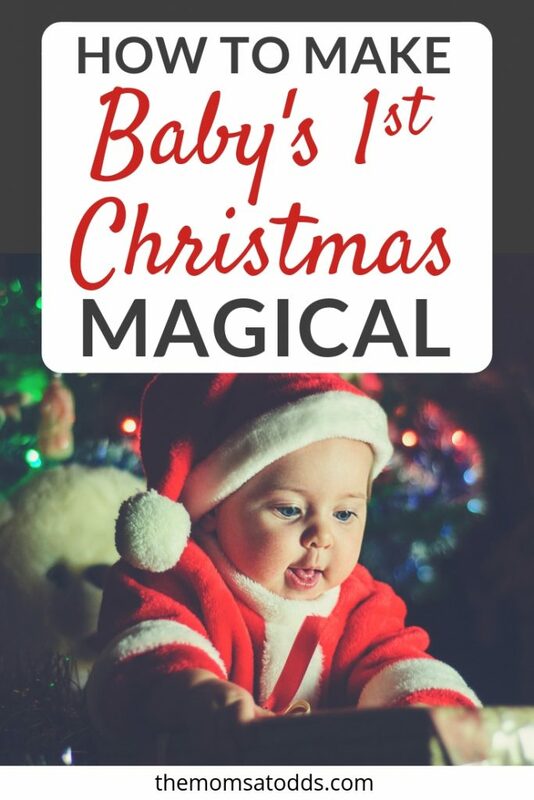 If you’re looking for some ideas on making your little one’s first Christmas magical, you’ve come to the right place. Christmas is just ‘round the corner and I’m getting super excited! Not only is this my favorite time of year, but its extra special this year because it is my baby’s first Christmas! For my oldest child’s first Christmas, I was in a new parent daze. Those first newborn weeks were rough and the holiday rushed by in a sleepless postpartum blur. This time around, my infant is older and I’m feeling more prepared. I’ve been brainstorming all of the ways I can include our littlest one in our Christmas celebrations. My top pick is this block ornament! It is super cute and I love that it so customizable! This sweet baby ornament is also adorable and includes free personalization! Seriously, this is one of the prettiest baby’s first Christmas ornaments I’ve seen! 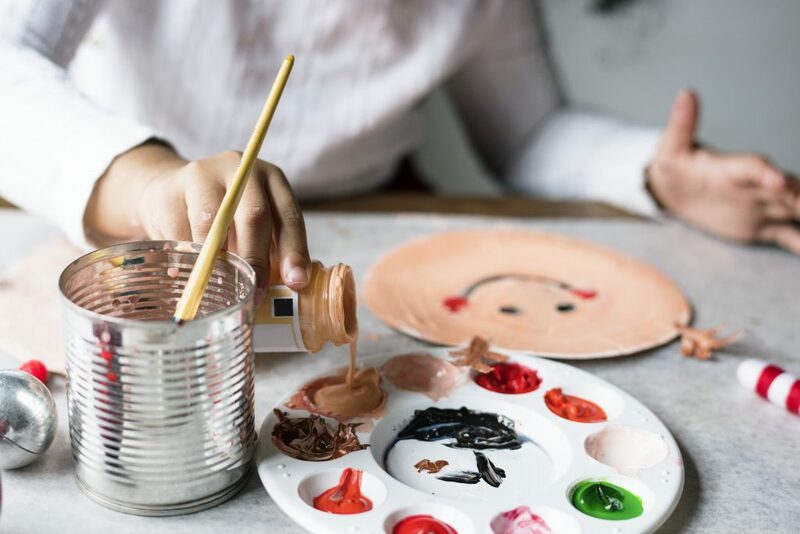 Even though baby can’t make the crafts themselves, they can help (sort of). The holiday is a great time to capture those adorable tiny hand and feet that are growing so fast. Salt Dough Ornaments are an awesome and easy way to DIY a first Christmas ornament with stuff you probably already have in your kitchen. Here is a great recipe and tutorial from Viva Veltoro. 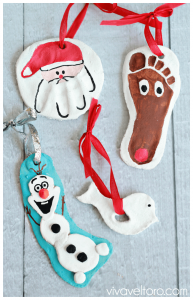 If you’re feeling a bit less crafty, you can get a kit to make a clay handprint ornament . 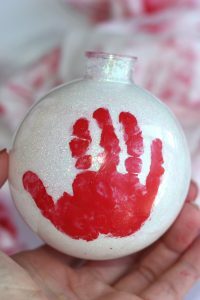 These adorable handprint ornaments from I Can Teach My Child are another great way to make your own baby’s first Christmas ornament. I LOVE “Mistletoes” footprints and they’ve been a big hit as grandparent gifts. Here is a cute printable from Messy Little Monster to make a mistletoes keepsake. This year I want to try something like this Baby’s First Christmas footprint plate from For the Love of Food. Baby needs their own stocking! Whether you want something to match the rest of the family, personalized, or baby specific, there’s lots of options for you. These stockings have a traditional look with free personalization ! These White Cable Knit Christmas Stockings are really beautiful and also includes personalization! In my family we always use the same stockings every year, but this Snoopy Soft “Baby’s First Christmas” Stocking and Hat Set is just is too cute! It’s always fun to have a special outfit for the holidays! We wear them all month in December (or for my toddler, all year). Include baby in the celebrations with an adorable, festive outfit! 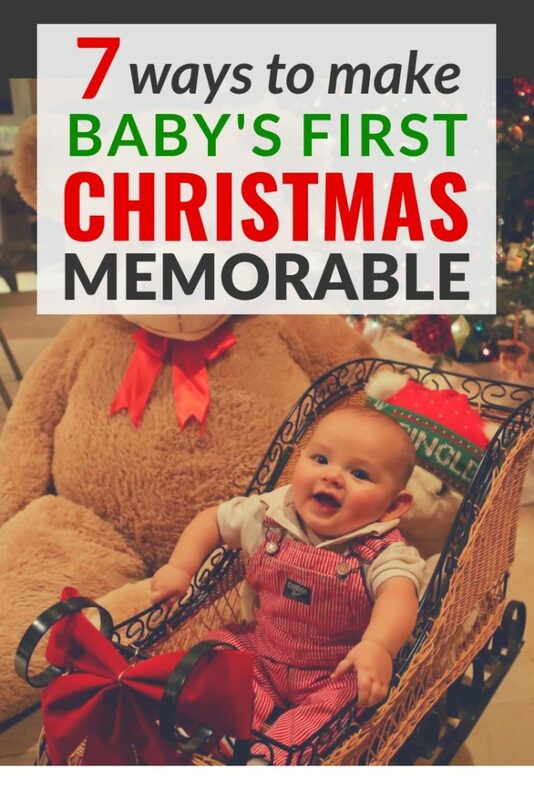 I really appreciate that this comes in larger sizes since it can be difficult to find “First Christmas” clothes in 18 month size for my big baby! Also, protect these cute outfits with some festive bibs! Money saving tip: A great place to find some gently used Christmas clothing is on facebook buy, sell, trade groups. You can also sell your kids stuff after the holidays to get a little cash back. New to BST? Check out Jo’s in depth guide. I have to admit that we have multiple pairs of Christmas pajamas, they’re just too darn cute. But for Christmas Eve we started doing matching pajamas a few years ago. Though my husband was a bit reluctant at first, I’ve gotten my whole family into it now! Admittedly, this one is a bit wordy for an infant, BUT its makes a great tradition! My family reads this every year on Christmas Eve, so we obviously had to continue the tradition. I still have the copy that I was gifted on my first Christmas. Look for one like this with bright and colorful illustrations to catch baby’s interest. We love the llama llama board books! They are short and sweet for little ones. The fun rhymes and colorful pictures make this a baby favorite. Not only is this book adorable, but it is actually indestructible. Feeling the paper-like pages, I was skeptical that this book could hold up to my destructive chewer. He has ruined more than one board book in our house, however, he was no match for the Indestructible. The best part is that it is washable too! This Curious George touch and feel book a favorite in our house. Touch and feel books are always a big hit with my little ones. The baby loves the bright colors and different textures, but it is also a top pick for my 3 year old. As far and touch and feel books go, this one has more things to actually touch than most. It’s the perfect time to get some photos for holiday cards or gifts. 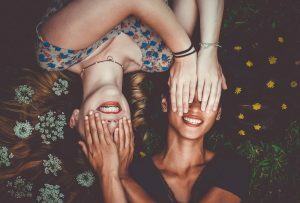 Whether you opt for a professional photographer or DIY pictures, here’s a few things to consider. I can not get enough of this little knit hat and diaper . It’s perfect for newborns! These stickers for all of baby’s first holidays are also a really neat idea to use throughout the year! 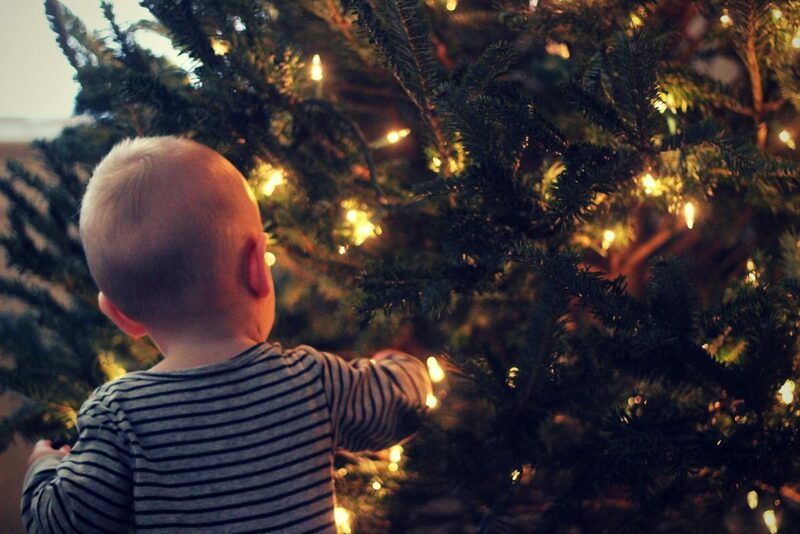 I love photos of babies with Christmas lights! But doing them yourself can be tricky to get the lighting just right. Here are some great tips from Spit up and Sit ups for taking those adorable pics at home! Make sure to take pictures of the family as well. Obviously, all of the kids together makes a great shot, but don’t forget to get in the pictures as well! Too often mom is behind the camera taking the pics and not actually in them. So set the timer or grab a friend to make sure that you have come photos of you with your baby and the whole family together! Get Tiny Ideas Baby’s First Christmas Holiday Photo Frame to show off their sweet photo! I like this one in particular because it includes a place to put their footprint! Pop baby in the stroller and go for a walk to see the Christmas lights. Your neighborhood is a great place to start, but also check for local events. Lots of places like zoos and gardens have beautiful light shows. Baby is sure to be entertained by the bright, blinking, colorful displays. 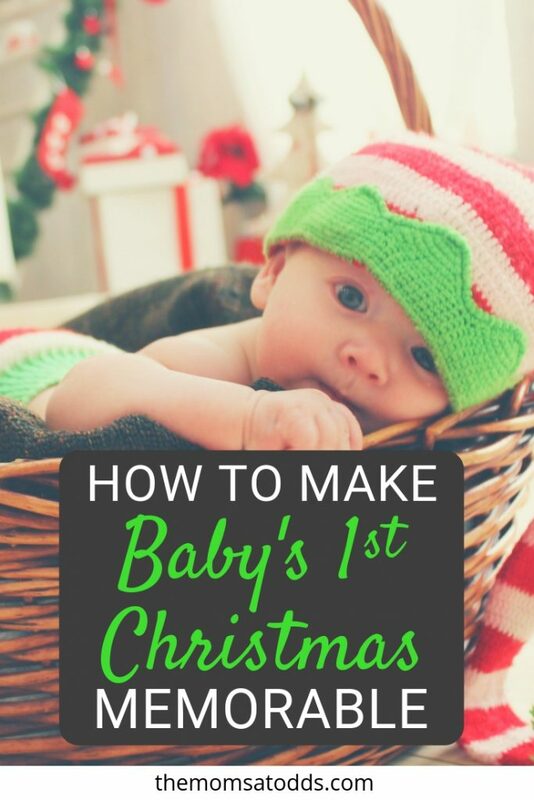 Just because baby isn’t to ask Santa for anything this year doesn’t mean you should skip this Christmas tradition. In my experience, the babies are actually the easiest when it comes to sitting on Santa’s lap. They don’t beg to go then freak out at the last minute and burst into tears or straight up refuse to sit like some toddlers I know. Plus the pictures are precious, even if baby does cry. 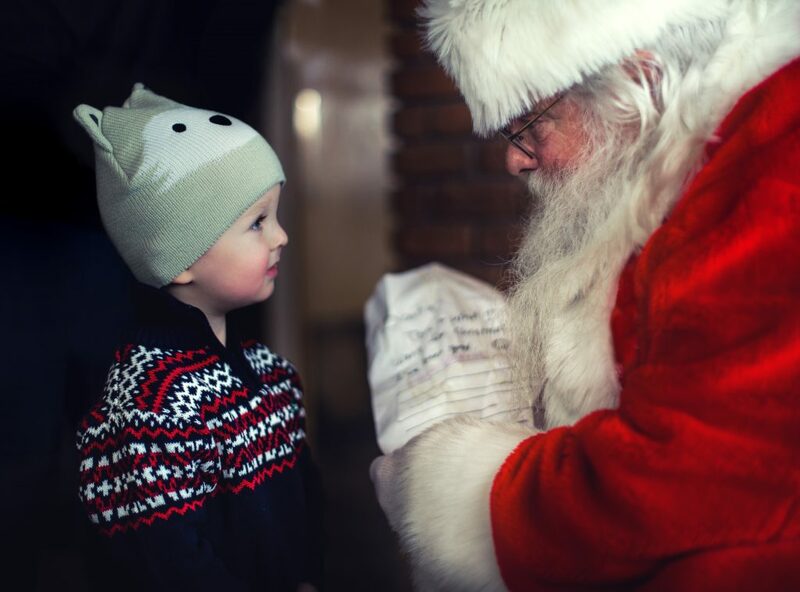 Related Post: Should you Teach your Kids to Believe in Santa? 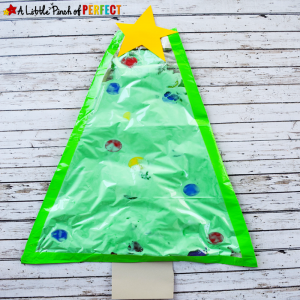 This No-mess Christmas tree from A Little Pinch of Perfect is a fun and festive sensory activity for little ones! I also love the way Lemon Lime Adventures uses Christmas lights in this sensory play making it perfect for baby’s first Christmas. Motherhood has pretty much destroyed my memory. Too many times I fell into the trap of thinking I would remember that adorable thing the baby did or the hilarious thing the toddler said only to completely forget the next day. So now I make a point to write those things down. If you’re keeping up with a baby book, be sure to jot down some of your favorite holiday moments with your baby before you forget! I have actually become a bit of a freak about remembering so I have a journal just for Christmas memories. Yeah, I know its a bit extreme, but I love looking back at past years! Anyone else celebrating their baby’s first Christmas this year? I’d love to hear your ideas on how you make it special! Is it Worth Decorating for Christmas when you have a Toddler? 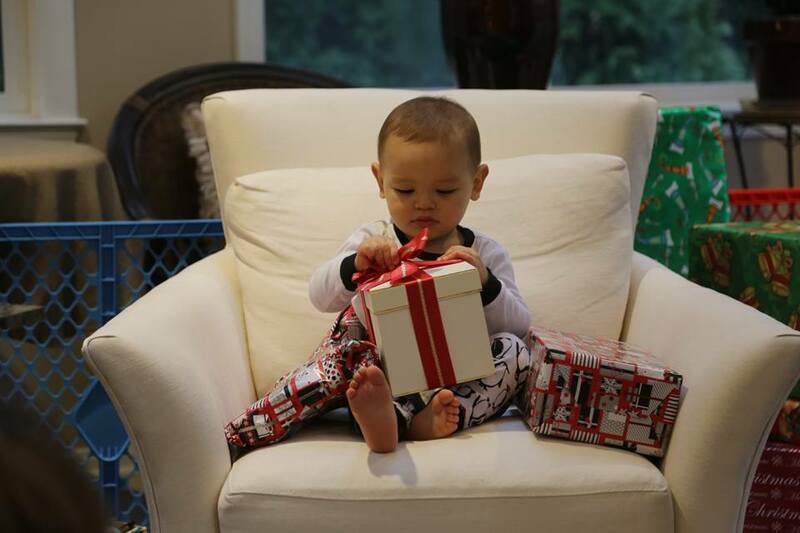 Can too many Christmas presents for your Toddler be a Bad Thing? Should kids believe in Santa Claus? Motherhood has also destroyed my memory #mombrain lol. Great ideas here! My daughter was only a month old around Christmas but we did a lot of the stuff on your list, except the stroller ride to see Christmas lights, I’ll have to remember that this year. Pinning for later so I don’t forget! The struggle is real! I had to write out this list just so I wouldn’t forget the things I want do to this year!